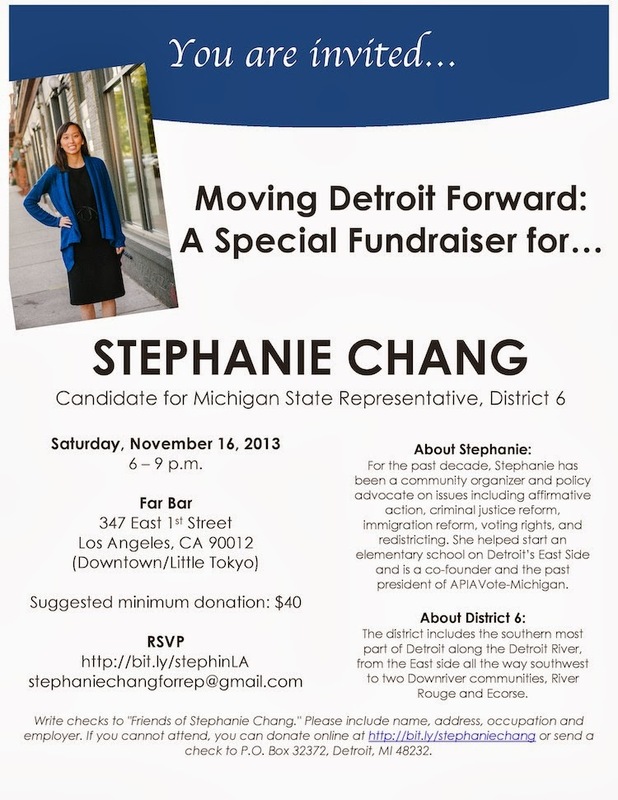 Moving Detroit Forward: A Special Fundraiser for Stephanie Chang...in LA November 16! Hey LA folks! and folks attending the Advancing Justice conference! My good friend Stephanie Chang (who I have been watching since she graduated from college at the University of Michigan) is running for Michigan State Representative of District 6, DETROIT!, and she is having a special fundraiser after the Advancing Justice conference on Saturday, November 16, 6-9 pm, at the Far Bar in LA's Little Tokyo, right next door to the Japanese American National Museum (JANM). 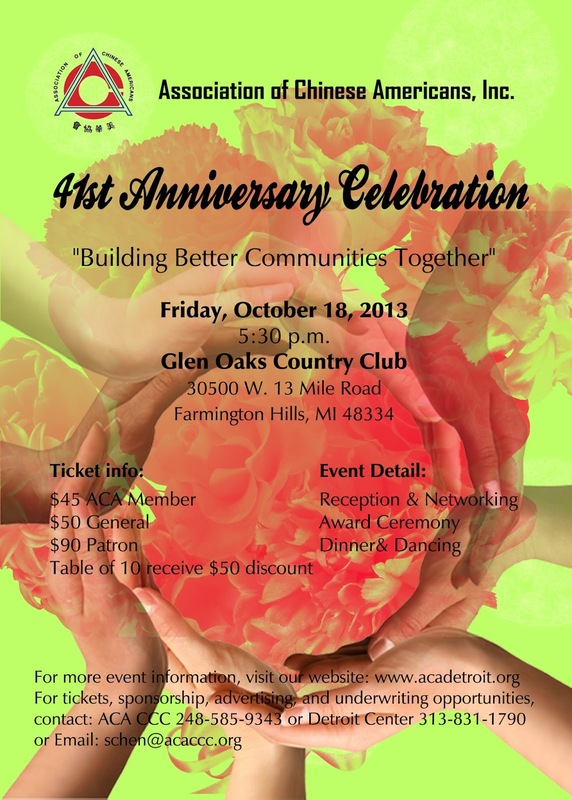 You don't want to miss this opportunity to support one of our community's bright young activists and you certainly don't want to miss the opportunity to hear about all the great cool things happening in Detroit. 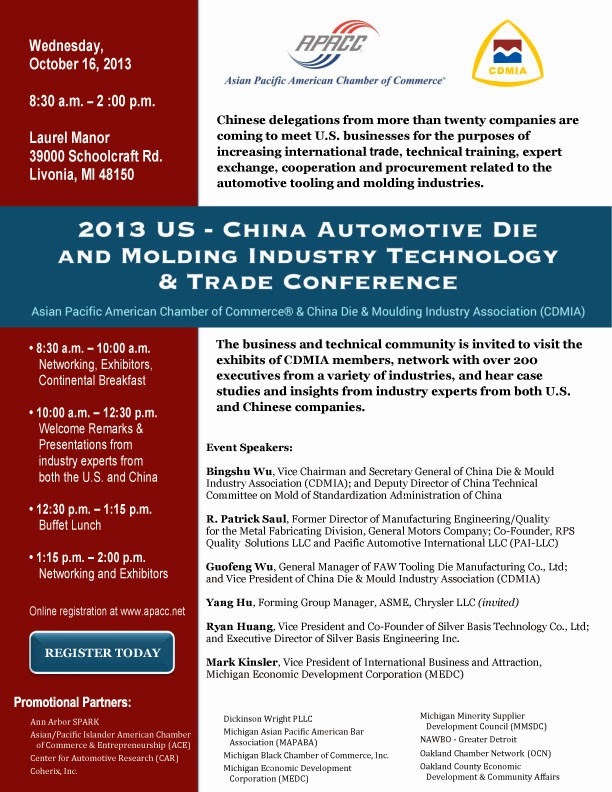 Michigan folks: Lots of opportunities to meet and support Stephanie Chang, stay tuned. Jeff Chu reading tonight at Nicola's Books, October 22, "Does Jesus Really Love Me?" The very cool and stylish Jeff Chu, author of "Does Jesus Really Love Me? : A Gay Christian's Pilgrimage in Search of God in America" and an editor at Fast Company, will be reading tonight at Nicola's Books, Tuesday, October 22, 7:00 pm. In this timely work--part memoir, part investigative analysis--a prize-winning writer explores the explosive and confusing intersection of faith, politics, and sexuality in Christian America. When Jeff Chu came out to his parents as a gay man, his devout Christian mother cried. And cried. Every time she looked at him. For months. As a journalist and a believer, Chu knew that he had to get to the heart of a question that had been haunting him for years: Does Jesus really love me? The quest to find an answer propels Chu on a remarkable cross-country journey to discover the God "forbidden to him" because of his sexuality. Surveying the breadth of the political and theological spectrum, from the most conservative viewpoints to the most liberal, he tries to distill what the diverse followers of Christ believe about homosexuality and to understand how these people who purportedly follow the same God and the same Scriptures have come to hold such a wide range of opinions. Why does Pastor A believe that God hates me, especially because of my gayness? Why does Person B believe that God loves me, gayness and all? From Brooklyn to Nashville to California, from Westboro Baptist Church and their god hates fags protest signs to the pioneering Episcopal bishop Mary Glasspool, who proclaims a message of liberation and divine love, Chu captures spiritual snapshots of Christian America at a remarkable moment, when tensions between both sides in the culture wars have rarely been higher. Both funny and heartbreaking, perplexing and wise, Does Jesus Really Love Me? is an intellectual, emotional, and spiritual pilgrimage that reveals a portrait of a faith and a nation at odds. "Love reveals us. Profoundly and unnervingly, love reveals us. I think this is something that can often be a source of comfort and dismay. Most of us are not used to being naked. And I can’t speak to the world, but that first time you disrobe—the first time you disrobe before someone you care about—shrinks in comparison to the first time you begin to unveil your internal self. What I think of the stories that I was overwhelmed by growing up, that astonished me growing up, I think they always drew upon that notion of how we are revealed in love." "Sometimes the right choice is also the hardest choice. Often, most of us choose for safety. I think it is easier to go to Mordor bearing the ring of the enemy than to advance into the unknown wilderness of another person’s heart." I'll be teaching three writing classes at Washtenaw Community College this semester, Fall 2013. 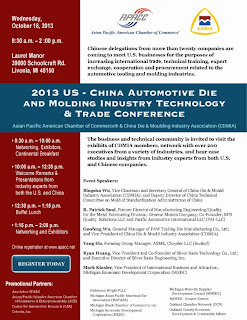 Register early and often! I'm teaching Conversational Chinese, too. Check this out, they are calling me a poet! I'll be reading with Tom Peek and Catherine Robbins at Ann Arbor District Library on Tuesday October 29, 2013, 7:00 pm, "Hawaii: Deep Beauty and Volcanic Power." We will also be discussing writing about place, culture(s), environmental and development issues. And snacks! Update: We will be joined by hula kumu June Yoshiko Kaililani Ryushin Tanoue of Halau i Ka Pono hula school in Chicago. This is very exciting! Tom Peek will be doing three readings in Ann Arbor, each with different content! Make sure to catch his reading at Nicola's Books, Wednesday, October 30, 7:00 pm. 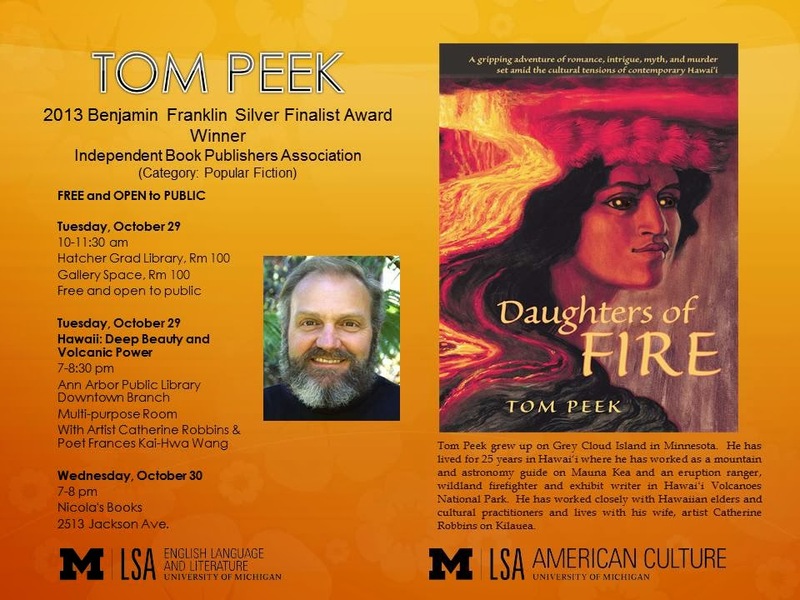 Looking forward to seeing my friend and writing teacher, Tom Peek, who will be doing three readings in Ann Arbor this month. 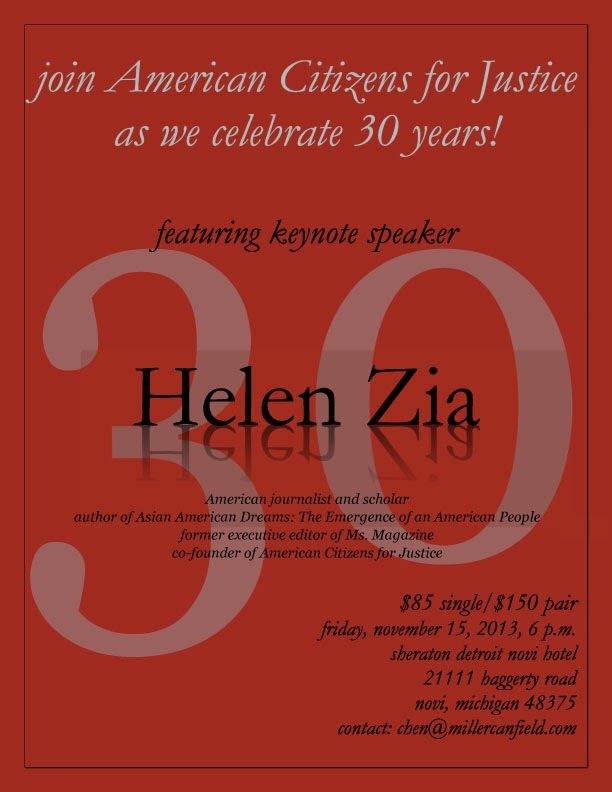 Here's the one I won't be able to attend, October 30, 2013, 7:00 p.m., Nicola's Books. Conversational Chinese class starts today at 6:00 pm at Washtenaw Community College! 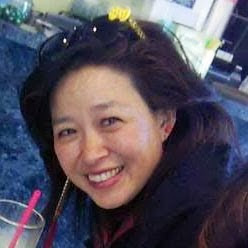 Helen Zia! American Citizens for Justice! Fundraising Dinner! 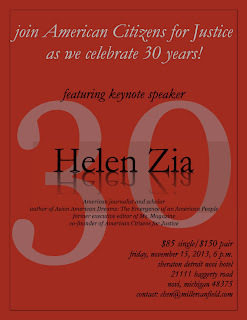 Helen Zia is coming back to Michigan for American Citizens for Justice / Asian American Center for Justice 30th Anniversary fundraising dinner on November 15, 2013! The colors are gorgeous in here. 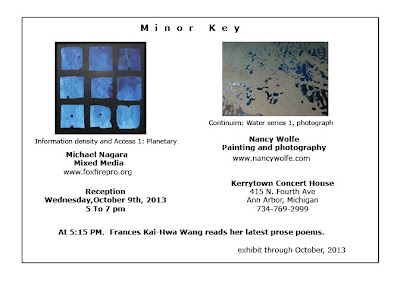 Congratulations Nancy Wolfe on a successful opening! Thanks for letting me be a part! Jeff Chu exudes cool and calm. 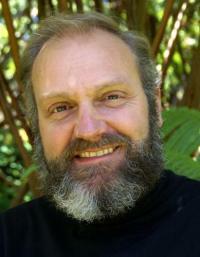 Looking forward to his reading at Nicola's Books, October 22, 2013, 7:00 p.m.